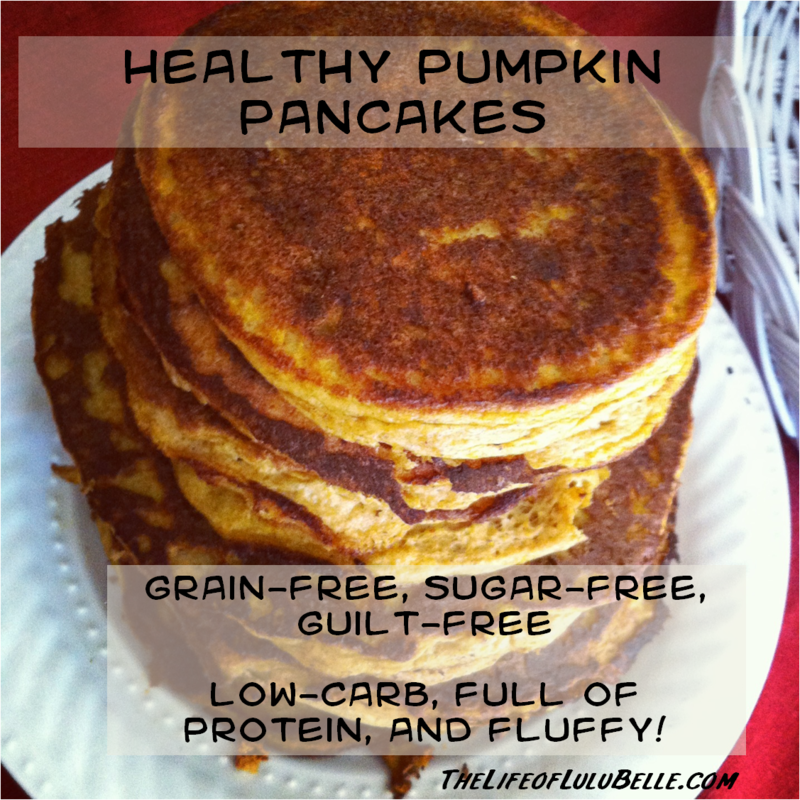 This week I had a request from the husband to make a healthy pancake with protein, that was low-carb and grain-free. I’ve had some success with grain-free, healthy pancakes, but I’ve also had a few failures. This time I lucked out and ended up with a great recipe I’ve already made a few times. 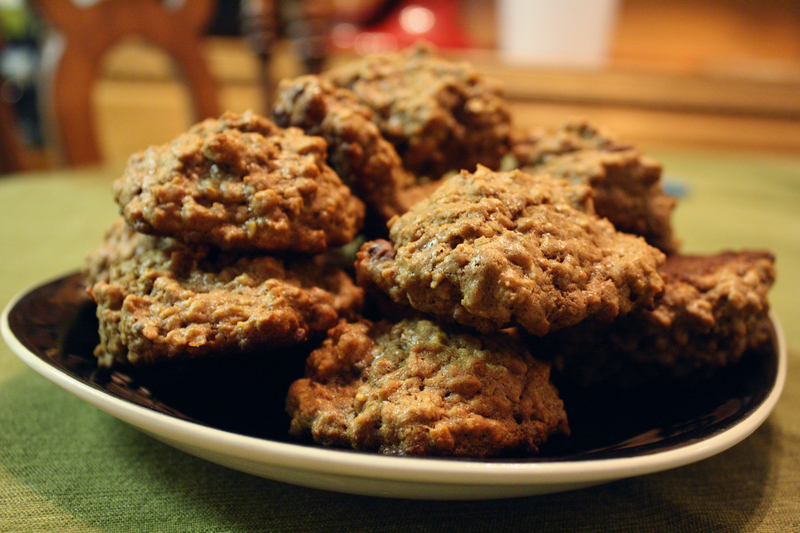 I even made a double-batch and stuck them in freezer for quick breakfasts or snacks. Find the recipe after the jump! I enjoy drinking a smoothie as a meal replacement. I think they are yummy and easy and it helps me not to make bad food choices when I don’t the motivation to eat leftovers. Is a shake the healthiest option for a meal? Maybe not, but I’m not sure. It works for me and I like it. I’m not a health professional and everybody is different, but drinking a smoothie for breakfast or lunch helps me out. My husband Marc is getting into power-lifting and gaining muscle-mass, so he is very interested in using protein powders. I like getting enough protein in my diet and protein powder is an easy way to do it. Marc came across True Nutrition’s website (through a variety of blog sources he follows) and we wanted to give it a try. A lot of protein powders (probably most of them) have undesirable ingredients like bad oils and preservatives and the like. It can be hard to find a protein that is “clean,” but True Nutrition seems to be pretty clean. I went to pick the protein I wanted, and there are a million different choices. You can choose what type of protein (they have all sorts of different kinds) and you can mix them if you would like. 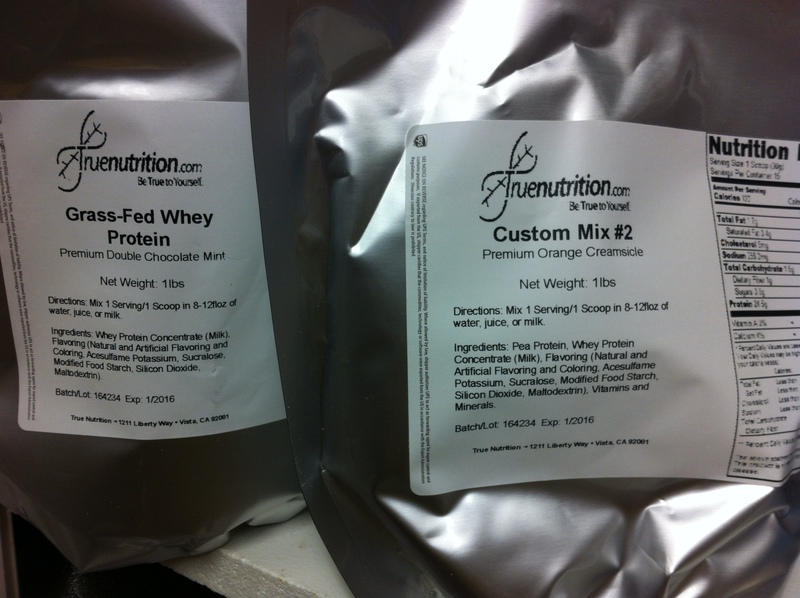 You can also customize your mix with carbs, fats, or supplements. Then you can choose a flavor and sweetener from a very long list of options. I’m breast-feeding and my little guy has issues with dairy, so I wanted to try a vegetarian protein source. I chose a pea protein, but because I really like whey, I made it 20% grass-fed whey protein as well. Marc chose the 100% grass-fed whey protein in double-chocolate mint, mine was orange creamsiscle. There was 54 flavors to choose from! The unsweetened chocolate or vanilla, or the plain, are the cleanest flavors, but we decided to go with the artificial flavorings. We aren’t perfect. The Double Chocolate Mint? AMAZING. It is really tasty. The mintiness of it actually reminds me of the taste of too much Torani chocolate syrup. I know that sounds weird and not really all that great, but it does taste good. I find that a lot of chocolate protein powders taste like minty hotdogs (which I do not like)… but that could just be me. The point is, this protein does not taste like hot dogs and I like the flavor. I can actually mix this protein in my banana and almond butter smoothie and it doesn’t give off a minty taste, it’s more of the chocolate syrup taste. The other protein was the Orange Creamciscle flavor, 80% pea protein, 20% whey. It was disappointing. You can actually taste the peas, and the orange doesn’t come through as much as you would hope. If I ordered it again, I would get the flavor “heavy” (you can specify the concentration of the flavor; light, normal, heavy). When I made my smoothie I ended up adding orange oil to it, which made it much better. I think adding the juice of an orange would make it pretty tasty as well, but by itself, I wasn’t a fan. What is my favorite way to use protein powder? A smoothie! Or shake, whatever you would like to call it. I use a hand blender now, so I no longer freeze most of the milk. Because only my banana is frozen, it is not a very thick consistency. If you want a thick, frozen-shake consistency, freeze half of the milk in ice cube trays and use that. I also blend all the ingredients, except the ice, until completely blended. I then add the ice and blend it last. Note: I am using this as a meal-replacement. This is not a 100-calorie shake. Nor am I a dietician. Make sure you find out what works for you, even if it includes talking with a professional. *I am in no way, being compensated for this review. I bought the protein myself and I am sharing my experience. This last week I added delicious Strauss milk back into my diet… and then removed it because it caused a rash (allergic reaction) all over my little guy’s face. I also over-cooked the grass-fed sirloins. Also, the starter on our second vehicle died and Marc is working long hours. I think I might be able to bribe my dad into taking me grocery shopping! I better make sure my grocery list is extremely thorough. We really should have gone grocery shopping yesterday, but it was my husbands only day off and the championship game was the only priority (this is 49er Country, just don’t tell the Raider fans)! Despite all of that, we managed to really clean up our diets this week and rid our body of all that sugar and junk. So that’s a win! When do all of you go grocery shopping? What’s on your meal plan? Yesterday morning I spent a couple hours scouring the internet on an empty stomach, looking for a breakfast cookie that was actually healthy and didn’t require a ton of specialty ingredients. I didn’t consider 1/4 cup or more of sugar to be considered healthy and I was amazed when people said the cookie was high in protein when they had less than 2 grams per serving. So I finally pried myself off the couch and went to work in the kitchen, challenging myself to make a healthier breakfast cookie. I concocted a cookie batter from various ingredients in my cupboard and hoped for the best! The batter seemed a bit soft, but I put them in the oven anyway. After about 11 minutes, I was pleasantly surprised that they had maintained their shape. They were fluffy in the center and slightly crispy on the edges (which is just how I like my cookies). The flavor was quite light and enjoyable. 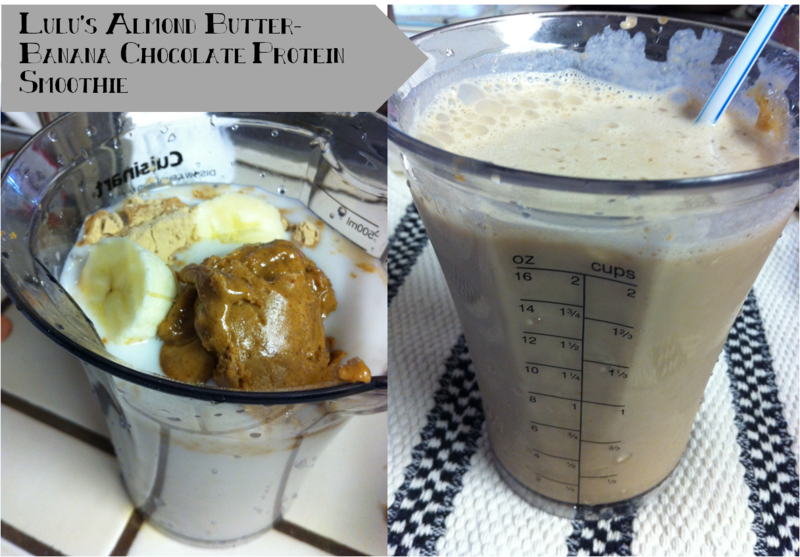 Next time I would probably not use the banana protein powder though, and keep it to vanilla (or maybe chocolate). The peanut butter did not come through, so next time I’m going to try to add more vanilla and cinnamon to taste like a regular oatmeal cookie, or perhaps replace some of the Greek yogurt with more peanut butter. I liked the cookies with the chocolate chips the best (who wouldn’t). The next day these cookies still had great texture and they weren’t overly soft (nor did they harden) like some cookies can get when you use fruit puree. I love waffles, but the traditional variety is really just a step down from cakes or cookies. My husband also aims at eating grain-free (a non-pregnant me usually does as well). I was thinking that waffles for Saturday morning breakfast would be delightful, if only I could try out a grain-free, sugar-free variety. 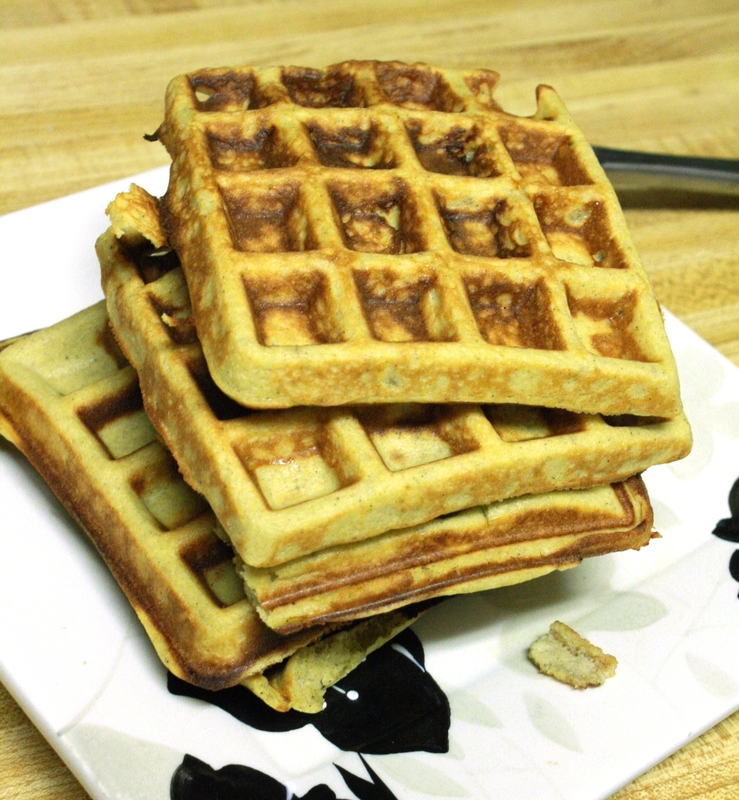 I came across Health, Home and Happiness’ waffle recipe and decided to give it a try! 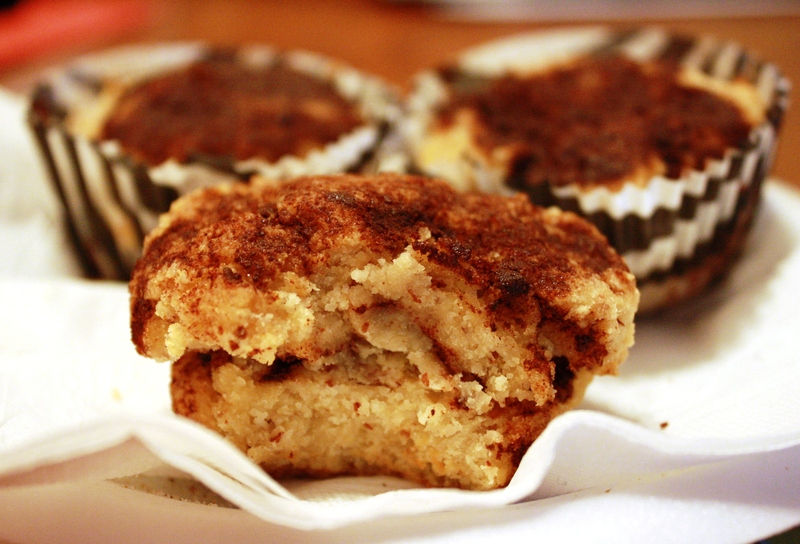 I love muffins and I love cinnamon, so of course I am going to love cinnamon muffins! I’ve been craving some muffins and I finally found the muffin recipe I made some months back and I altered the recipe a little bit with what I had in the house already. The base of this recipe comes from Comfy Belly’s Cinnamon Bun Muffins; I just used some slightly different ingredients and measurements. These muffins are dense and moist and really hit the spot! My husband wakes up quite early to get ready for work and sometimes he gets tired of eating eggs and bacon every morning (and since being pregnant, I am not a fan of the smell of bacon lingering in our home, either). 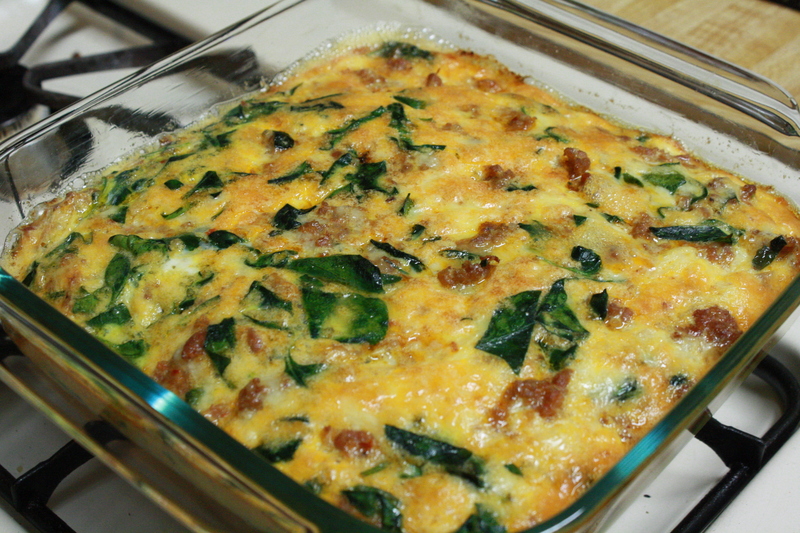 Last night he prepped and cooked a simple, grain-free breakfast casserole (inspired by this recipe) and had it ready to go the next morning. 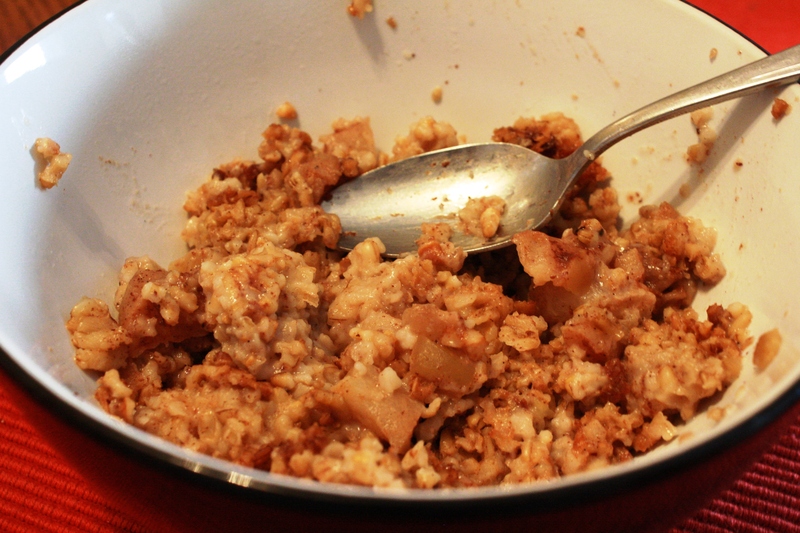 It was a quick, easy, and healthy solution to breakfast! Just a few more days until Christmas and I’m super excited! My holiday celebrations kick off tomorrow evening so I will have a festive filled Christmas weekend. To elevate my mood even further, I was able to enjoy a real food breakfast this morning and a real food dinner last night (which has been few and far between since becoming pregnant)! I’m spending today decorating our traditional sugar cookies and prepping grain-free meatballs so I can throw them in the crockpot tomorrow morning. I’m also getting the final ingredients to make our traditional Christmas breakfast. On Christmas morning my brother and mother (and maybe some cousins) are joining me and my husband for breakfast and a gift exchange and while my husband cooks eggs and bacon, my brother will be making biscuits and chocolate gravy. Yes, you heard right; chocolate gravy. My father has a lot of family from Tennessee and the South and I am sure chocolate gravy is much more popular over that way than here in CA. When we visited some maternal family in Oklahoma our great aunt Sue made us chocolate gravy and biscuits as well. My brother won’t let me post our family’s recipe, but this I found a recipe online that is pretty similar. We don’t usually let it get as thick as pudding, we like it a bit more runny, so we substitute some of the milk for water. Mix all the dry ingredients in a heavy saucepan with a whisk. Using a whisk blends everything better than a spoon. Stir in the milk. Cook over medium heat stirring constantly. Remove the pot when the mixture is thick like pudding. Add the butter. Stir in until completely melted. Serve over biscuits with a teaspoon of butter dolloped on top. Even though our preferable lifestyle/eating habits are whole foods (and generally grain-free) I think it’s ok to have a special treat once in a while. I think a great healthier alternative would be soaked cinnamon rolls from Modern Alternative Mama’s new book, Treat Yourself, which you can win! What are you making Christmas morning? We are 5 days into Whole30 and it hasn’t been bad at all. We generally eat grain-free anyways so the transition wasn’t too bad. Marc does miss dairy and I do want butter, but overall the only other thing I’ve wanted is junk food and that’s not good for me anyways. Actually I’ve missed chewing gum, which isn’t allowed on the food challenge because it can still cause insulin spikes. Why are we doing the Whole30? My husband has been having some abdominal pain that has been diagnosed first as gas, then as reflux but nothing has helped and 2 years later he wants it gone. An elimination and no-cheating diet to jump start good eating habits seemed like a good idea. Whole30 (correct me if I am wrong) is a strict paleo diet – no grains, no legumes (which includes peanuts! ), no sweeteners, and no dairy. After the Whole30 we are going back to more primal-style of eating; we are fans of butter, raw milk, whole and cultured yogurt, and unprocessed cheeses in moderation. You aren’t supposed to weigh yourself during this diet, but we have been. Marc has lost about 5 or 6 pounds, I think I’ve lost maybe 2 (I’m a woman with less to lose). I think this diet has me craving exercise though! We’ve gone walking and I do weights and exercises at home (I’ve been craving lap swimming though). Problems or issues with the diet? None, except Marc developed a small rash middle-way on his left side of his back. Some kind of die-off maybe? Grapes, cantaloup and other fruit, raw nuts, carrots and snap peas dipped in hummus and guacamole, kombucha, and tuna and avocado. We need to find bacon and beef jerky without sugar!